Since Red had been hankering after playing the “Feature Game” for a year or so, the first thing we had to do was work out who was going to play it. With Burgundy starting his pizza, and Red and Blue’s still to come, we decided to play something to keep Pine occupied while we waited to see who else was coming. We were just setting out Bokken Schieten (aka Ziegen Kriegen) when Purple and Black arrived closely followed by Green. Pine was sure Ivory wasn’t coming, so with two copies of the “Feature Game” to hand, we then began a debate about how to divide the group into two. At this point, the matter was sort of settled by Ivory’s arrival, so the four player comfortably ensconced at “the wrong table” continued setting up their “goaty game” while the others migrated back to our usual, now vacated table. Bokken Schieten (aka Ziegen Kriegen) is a simple little “push your luck” game, based on Blackjack (aka Pontoon or Vingt-et-Un), but with a moving target. Thus the idea is to collect cards up to a limit, but exceeding that limit yields a score of zero and the player is “bust”. So, players choose a card from their hand and play it face up in front of them – the person who plays the highest card takes the trick and with it all the cards played in the round a score equal to the total number of goats heads on the sides of the cards. Unfortunately, they get to lead again and worse, the player in last place gets to add a card to “Goat Island” and choose whether to contribute the larger or smaller number to the limit. Burgundy went bust first taking the first two hands, followed by Red. When Blue dumped a nice large card onto a trick Pine was winning he went out too, leaving Blue to take all the final trick. The only question was whether she had managed to stay within the limit, but finishing with twelve, and given a limit of twelve she just squeaked in to win. With that done, and the pizzas also taken care of, it was time for Keyflower, the “Feature Game”. This is one of the group’s favourite games, but has been someone neglected of late. On checking back, we found it was two years since we last played it, though we had played Keyflower’s little brother, Key to the City – London (released at Essen last year), more recently. Both games have the same general flow, using the same tile laying and auction mechanism, but with different tiles and resources used in different ways. The basic mechanism is quite simple, though the resultant game is much deeper. The game is played over four rounds or Seasons, with players taking it in turns to bid on a tile, carry out an action or pass. 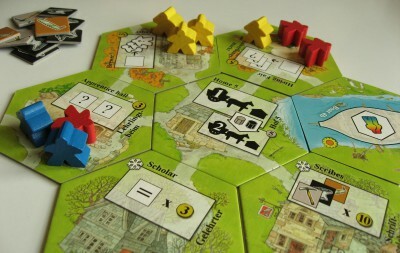 Once everyone has passed in succession, the round is over, and the tiles are are added to the winning players’ villages. After four rounds, the player with the most points wins. The clever part of the game is that the bidding and actions are both carried out with Keyples (which is what meeples are called in these games). So, on their turn, the active player can bid for one of the tiles. If that tile already has a bid against it, then the active player must follow suit by bidding with the same colour and with at least one additional Keyple, thus increasing the bid. Only winning bids are paid for at the end of the round, with loosing bids are returned to their owner, which is just as well because Keyples are scarce, very scarce. In fact, losing bids belong to their owner during the round too as players can move losing bids and use them elsewhere adding more Keyples if necessary. On their turn, players can also activate tiles by placing Keyples on the tile which gives a resource or an action. These resources are then placed on the tile or, in the case of skill tiles, placed behind their player screen. There are several different actions available, but one of the key things players will want to do during the game is upgrade tiles. Tiles are double-sided: when a tile is first added to a village, it has a corresponding action, but upgrading and turning it over will make it more useful. For example, the Workshop tile gives either one coal, one wood or one stone, but when upgraded gives one of each. Tiles can typically be activated three times each Season, but players must follow colour suit and the cost increases by one each time; tiles can hold a maximum of six Keyples. One of the more unusual things about Keyflower is that players can activate the tiles in other peoples’ Villages. This is interesting because the first player to activate a tile dictates the colour for the rest of the round, so if an opponent activates a tile with “the wrong colour” it can make life very difficult for the Village owner. On the other hand, since all Keyples working in the Villages return home and go behind the owners’ screens at the end of the Season, activating a tile in someone else’s Village is effectively giving them valuable Keyples. Perhaps one of the most interesting thing about the game is that strategies almost never turn out quite the way people plan. Other players can innocently make a tile too expensive or even completely unattainable by starting bidding with “the wrong colour”. Also, although the tiles are well balanced, depending on player count, some tiles are not introduced into the game which can make it difficult to get that resource that was essential to a that particular strategy. This means that players tend to do best by keeping their options open for as long as possible and then trying to bring it all together at the end. 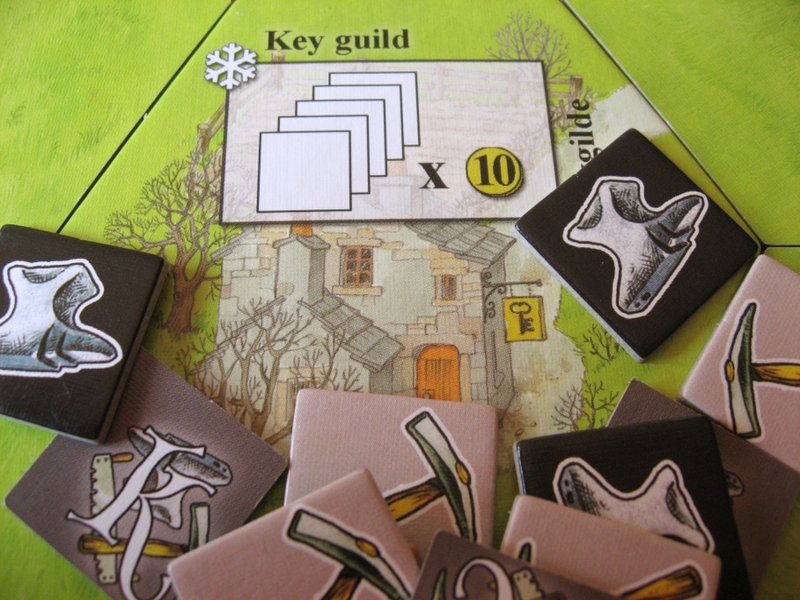 At the start of the game, each player is given some tiles for the final round, Winter and each player can choose which of these they want to make available to the highest bidder. They can choose as many as they like to introduce, though they must include at least one. This decision doesn’t have to be made until the start of the final round, so although they don’t direct players’ strategy exactly, they can give people a bit of a general steer. The first group of players were Green, Black, Purple and Ivory. Green, Black, and Purple have played Keyflower quite a bit over the years, and although Ivory was new to the game, he had played Key to the City – London, which has a lot of similarities. This made the group quite experienced, but that is certainly no guarantee of success in Keyflower. And how many points make success, was something Ivory asked before they started and received the reply from the other side of the room, “Over a hundred!”, to which, everybody laughed. Spring is the Season for resources, and Purple led the way by picking up the Key Mine, Key Wood and Keystone Quarry tiles providing coal, wood and stone. Although a strong start, sometimes it is easy to get carried away with bidding which can result in a shortage of Keyples for later rounds. On the other hand, if the tiles are particularly useful, they can prove a valuable source of Keyples when other players are tempted to activate them. Unfortunately for Purple, Ivory picked up the Workshop and quickly upgraded it making it a much more enticing tile. Purple’s cause was not helped by Green who was being particularly parsimonious with his Keyples as he had the Craftsmans’ Guild as one of his Winter tiles and was hoping to make it pay at the end of the game. Useful actions can be a double-edged sword however, as Black found out to his cost when everyone kept activating his tiles before he got the chance, and generally with colours that he did not have. Going into the final round, everyone’s plans were on a knife edge. 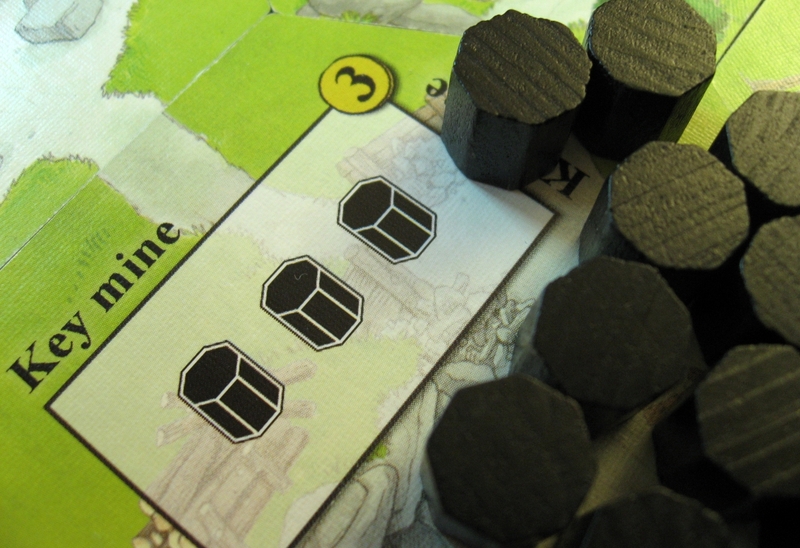 Black’s plans fell apart when, after picking up the Stone Yard (which rewards players for getting stone), in a fit of enthusiasm he upgraded his mason tile. This meant that instead of turning skills tiles into stone, he could now turn them into gold, which is very nice, but was worth about half the number of points to him as well as being a lot more interesting to everyone else. As Winter progressed, the bidding got more determined and everybody had to fight their corner, but especially Green and Ivory. Ivory took the boat tile Green was after, but failed to stop Green winning the Craftsmans’ Guild. Ivory had been quietly collecting skills tiles and squirrelling them away behind his screen, and it was clear why when the Scribes tile appeared at the start of Winter. Green made his move early, putting in a large bid to try to stop him from getting it, but when Ivory countered, Green couldn’t afford to increase the bid further. In fact, it wouldn’t have helped if he’d been able to continue, because Ivory had a number of Keyples in reserve, just in case. And it was those reserve Keyples that clinched it, with Ivory winning with seventy-six points, twenty-one points ahead of Green in second. On the other table, things went a little differently. While Blue and Burgundy had played Keyflower a lot and it was one of their favourite games, Pine had only played Key to the City – London, and Red was completely new to the game, though she had been hankering after giving it a go for a ages. In this game, Pine started off very strongly and then proceeded to build a very nicely balanced little village coveted by both Blue and Burgundy. With both the Miner and the Gold Mine tiles as well as as the Smelter, Pine had access to coal and lots valuable gold and the others felt he only needed a couple of nice Winter tiles to top it off for a really high score. Burgundy picked up the Keystone Quarry giving him plenty of stone once he had upgraded it. As it was, Burgundy’s Workshop was in high demand for those who needed timber for upgrading their home tiles, but the almost complete lack of wood in any Village, became apparent when the Timberyard and Sawmill tiles both appeared in autumn and nobody had any wood to do anything with them. Burgundy’s problems were exacerbated by the shortage of tiles that would give points for stone. Having bid for a lot of tiles in the opening round, and won none Blue was left trying to make a silk purse out of a sow’s ear and cobble together a score from the Apprentice Hall and the flotilla of boats she ended up with at the end of Spring. As she was completely new to the game, Red found herself a little overwhelmed by the amount the game gives players to think about. While the mechanics are fairly straightforward, there are a lot of considerations to take into account when bidding and, unlike the arguably slightly simpler Key to the City – London, getting resources to the right location can be challenging. Red started off with the Peddler tile in spring, which enabled her to swap yellow Keyples for special green Keyples. This gave her an early start going for the Key Market Winter tile that she had in her hand (which rewards players for the number of green Keyples they have at the end of the game) with the added bonus that she would be in a strong position to bid with green Keyples if she needed to. Despite having a fair idea what people had, somehow the Winter tiles were still a bit of a surprise and the scrap began as players tried to make they didn’t lose out. With the other game finishing first, the others came over to spectate and see how their game had compared. Burgundy got his Craftmans’ Guild tile and, tried to stop Blue picking up both the Key Guild and the Scholar, but with both in the game, it was odds on that Blue would get one. In the end she managed to take both and having a huge pile of skill tiles to go with them gave her a healthy number of points. Pine took the Keythedral and decided to fight for his choice of end game boat tile, taking the Keyflower tile giving him points for his transport abilities. As everyone was a little short on Keyples except Blue (largely thanks to having not spent any on bidding during the game) was also able to pick up the Village Hall (and score points for the large number of Red Keyples she had amassed) as well as picking up sixteen points for her sizeable river. These gave her a total just shy of that magic hundred, and thirty-seven points ahead of Pine who’s lovely little village gave him an excellent second place. The first player to have at least one of each colour face up collects an intermediate bonus, which diminishes for players who achieve this feat later in the game. Players with six or seven different colours at the end of the game receive five or ten bonus points respectively. Each player starts with a hand of eight cards and a face down deck of twelve cards. When they have played their hand down to the last two cards, they can draw back up to eight. This introduces just a little bit of stress during the game, and prepares players for the inevitable stress at the end. And stress there was a plenty. Blue had played the game a few times with Pink and found it interesting, however, with four it has added spice, especially towards the end. Blue picked up the first intermediate swiftly followed by Pine and then Red. Burgundy is well known for his muttering, but this time he had Pine for company. In fact, Pine soon surpassed Burgundy, muttering about how nasty the game was. When it came to the end-game scoring it was clear that he had something to mutter about finishing with almost as many negative points as positive ones and he was only saved from the ignominy of a negative score by the intermediate bonus he had collected. Perhaps she was too tired to moan or maybe she didn’t feel the need, but Red quietly just got on with the game and, with perfect timing, took the full ten point bonus at the end of the round. With Burgundy doing the same, it was close at the tome, but Burgundy just sneaked in ahead of Red, finishing five points clear with forty-seven points. Learning Outcome: It may be Nasty, but “The Nasty Game” is Good Fun! This entry was posted in Games Night and tagged 3 Sind Eine Zu Viel!, 6 Nimmt!, Bokken Schieten, Key to the City: London, Keyflower on May 30, 2017 by nannyGOAT.